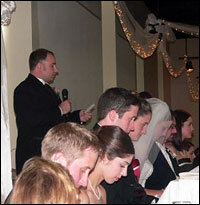 Create Your Own Inspirational Groom Speech?" With "Groom Speeches" you'll also discover what you must know about presenting and delivering a speech in a professional manner that suits the occasion. Thousands of people, just like you, worldwide have used my techniques to write and perform a fantastic speech, whilst having piles of fun in the process. Will you be next? "Let me just say Dan that the prospect of speaking to a large crowd of people was a little daunting to me. Add to that the fact that I was about to speak to a crowd consisting of some of the most important people in my life at one of the most significant occasions, my wedding, and it would be fair to say that I was down right terrified by the thought. Hi, my name is Dan Stevens and I'm author of the hugely popular "Groom Speeches - Say The Right Words At The Right Time". I've read all the speech books, I've talked to lots of other great speech writers and public speakers, I've surveyed former customers, I've done all the research and, after doing all of that, I am convinced that "Groom Speeches" is the single best source for your quality Groom speech. My information is the easiest to follow speech material around. It is jam-packed with everything that you need to be able to write, and present, the ultimate Groom speech! When we surveyed my subscribers from around the world and asked "Did Dan's information help you write and deliver a better speech? ", 93% said "Strongly agreed"
"Your book was well worth it, and I rarely say that about any product. I couldn't possibly put a price on the feeling I got from delivering such a good speech and everybody loved it!" AND now YOU are about to discover amazing methods to writing and delivering the perfect grooms speech! Whether you are having a formal wedding, a more casual event, or simply want to become exceptional at public speaking, then you have come to the right place. No matter what your previous experience of speech writing and delivering is, this information applies to you, you'll even amaze yourself! Giving a speech at a wedding is a huge honor. If you want to give the Bride and guests the respect that this great honor deserves, then this could be the most important letter you will ever read. You do not need to worry about whether or not your speech stacks up against other speeches given by the Bestman, Father of the Bride, or any other speakers at the wedding. Imagine the immense personal satisfaction you'll gain from delivering an inspirational speech that makes your Bride proud and leaves the audience in fits of laughter. Now, try to imagine the alternative. Anything but the best for your bride makes you feel flat, right? You owe it to yourself to give the best speech that you possibly can, and this is your opportunity to get your hands on 20 of the most outstanding and entertaining speeches written specifically for the groom that you will ever see. And you'll also gain comprehensive, step-by-step, information about every aspect of the speech writing process from preparation, through to delivery. My Groom Speeches are GUARANTEED to be the best! I've even been working with the major U.K. publishing company, Chrysalis, and they will be releasing a book with several of my sample best man speeches in it (the very same ones that are in my best man speech book! ), in the next couple of months. Well it's all because of my 20 one-of-a-kind, knockout, sample Groom speeches that have been crafted to perfection - and are guaranteed to work for anyone! 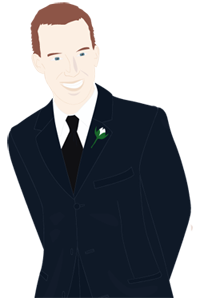 Not to forget the Groom Speeches explains in a super easy to follow format - how to deliver a sensational wedding speech. Access to 20 professionally written, top quality groom speeches, so that you can pick and choose the best parts to make your own unbelievable speech. Impress the bride and everyone else with a heartfelt, meaningful speech that is the highlight of the reception and that they will fondly remember forever. You can edit, copy, paste, add, delete and completely mold these groom's speeches into your own words! "Groom Speeches" comes professionally laid out and graphically designed so that is easy to read and covers everything that you need to know about giving your wedding speech! The full Groom Speech package is available via instant download! You can be putting together your speech in less than 5 minutes! Even if you have never downloaded something from the internet before it comes with instructions, it's so easy! You receive the Groom Speeches package at a lower price because it costs us less to produce. Because I am so sure that Groom Speeches is exactly what you need to fast-track your speech writing and improve your speech delivery out of sight, I would like to make you this special offer! As I mentioned this special price is only valid until midnight Saturday, October 11th. My special offer may not continue after this date! Order Here! I PERSONALLY GUARANTEE that these will be simply the best Groom speeches that you can buy on the internet. If they don't measure up in any way, shape or form then let me know for a prompt and full refund. I insist that you order Groom Speeches - Say The Right Words At The Right Time! entirely at my risk. That's why this collection comes with a Risk-Free 60 day 100% Money-Back Guarantee. There's absolutely NO RISK on your part. Bachelor Party Ideas- How To Throw The Killer Bachelor Party! Kent Sayres, Total Unstoppable Confidence Audio Program! I am really looking forward to getting an email from you, telling me about what a great time you had at your wedding! Even though I get lots of email, I am always glad to get constructive feedback on Groom Speeches so that we can make the experience even better for future grooms-to-be! P.S. Remember, If YOU Want to Prepare And Deliver Your Speech Quickly And Easily Then Groom Speeches Is For YOU! Need Some Great Ideas For Throwing A Top-Class Bachelor Party? Give Yourself The Stag Party You Deserve!! To use it, all you have to do is slip on your headphones, pop on the audio program, and listen and relax. Kent's powerful hypnosis technology takes care of everything else! This is a must-have product for you if you want to skyrocket your confidence. This course sells on Kent's site for $19.99, so is a fantastic bargain as it is included FREE with every copy of Groom Speeches!